A 1200km loop from Fernie BC, through the Flathead, Idaho, Washington, and back into the Canadian Kootenays. Do you like trees? Feel like you’re not getting enough quality time with them in your everyday life? Then this is the route for you! Guaranteed to give you your daily fill of trees, combined with gorgeous gravel roads over rolling hills and mountains, and just enough icecream stops to keep you going. Starting and finishing in Fernie, the route winds down through the Flathead, Kootenai, Idaho Panhandle and Colville National Forests, from British Columbia into Montana, Idaho, Washington, and back into British Columbia again. 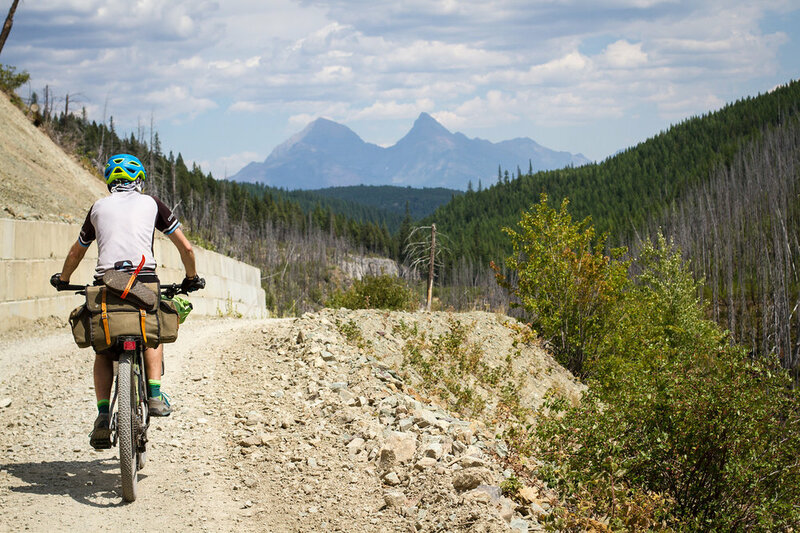 You’ll travel along portions of the Great Divide Mountain Bike Route and the BC Epic 1000, as well as a selection of random gravel roads and some paved road to connect everything together. This route passes through the traditional territory of the Blackfoot, Ktunaxa, Kalispel, Pend d’Oreille and Sinixt people. 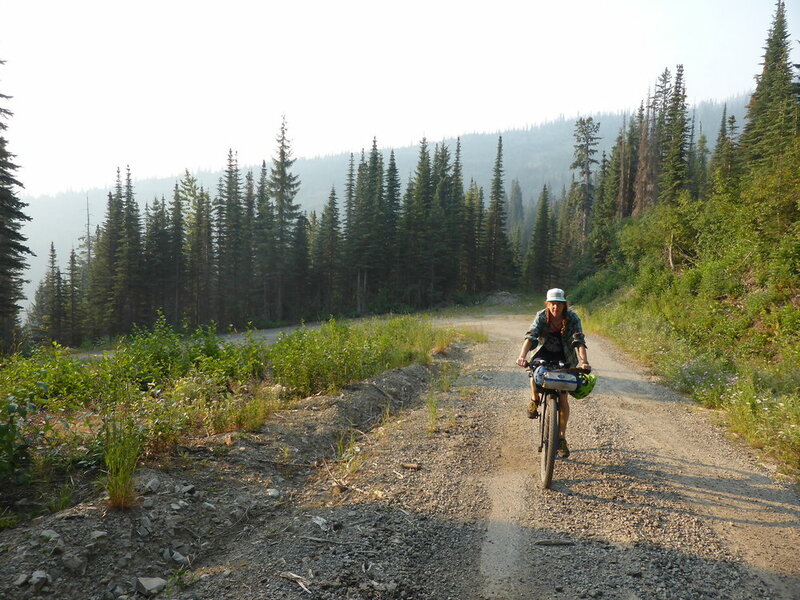 The first section out of Fernie takes you into the wonderful Canadian Flathead. If you take this route option, you’re looking at a 130km stretch before you hit resupply again in Eureka. Alternatively you can jump on Hwy 93 south of Elko, and take the direct route down to the border - faster, but far less fun. After Eureka there are a few camping options as you follow the GDMBR up Graves Creek Road and over the Whitefish Divide. Red Meadow Lake campground is definitely a great place to spend the night though… at least if the snow has all melted by then. The descent past there to Whitefish is pretty fast, although you end up on an increasingly busy stretched of paved road again for the final 12km into town. Whitefish is a great major resupply spot, with a bike store, as well as a store called Amazing Crepes (yes, they really are amazing). Whitefish Bike Retreat makes for a perfect spot to spend the night (or two) after that. Watch out on the stretch of Hwy 93 after Whitefish Bike Retreat, it can be very busy and the shoulder is narrow. Tally Lake comes along not long afterwards - in theory it sounds like a great spot, but it’s swamped with RVs, boat ramps, custodians with golf carts, and there’s a day use fee. Beyond Tally Lake are some wonderfully deserted gravel roads and a couple of big climbs - it’s possible to skip the second one if you’re pressed for time or energy, but it’s a lovely climb and descent if you have the legs for it. Dropping down to Libby Dam gives you the chance for some casual touristing, and then the Dunn Creek campground is a nice little spot on the river. It doesn’t take to long to roll into Libby after that, for a quality small Montana city experience. Keep an eye out for the eagle sculptures! 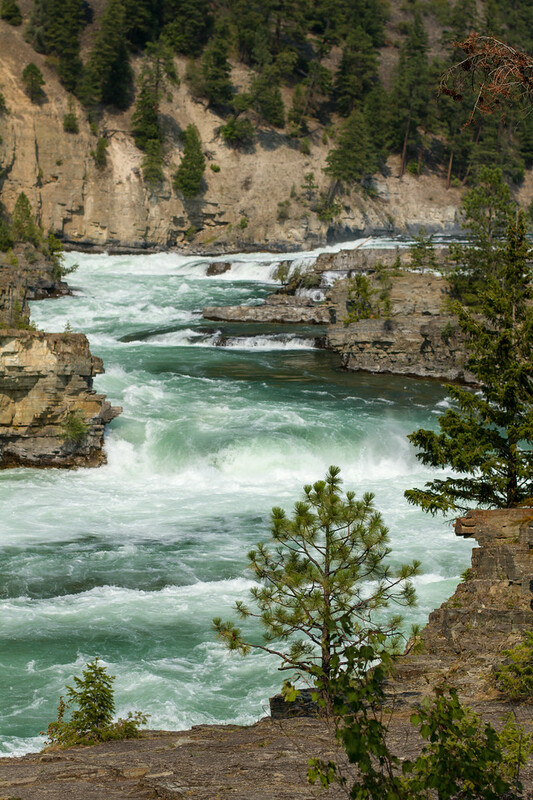 The next little section has you on the highway, but gives you the chance to stop off at Kootenai Falls. They’re beautiful to check out if you’re happy leaving your bike locked up in a busy tourist spot. (Plus side, there’s icecream at the concession stand!). Ride into Troy if you’re in need of another refuel, but otherwise turn off and head up the Keeler-Rattle road. It’s a slow and gradual climb, beautiful and deserted with alternating gravel and post-apocalyptic pavement and plenty of water. Just before the top you hit the Keeler warming hut - it’s for snowmobilers only, and no overnight camping is allowed. It is accompanied by a very handy washroom though. After the pass you’ll have a heinous hike-a-bike descent over an ex-road through bear territory. Make lots of noise, and expect it to take a few hours. If you want to skip this section, you could ride around to either the north past Troy, or south along Hwy 56 and through Clark Fork. Sandpoint, ID is another great major resupply with good bike facilities. From there some quiet sealed roads take you into Newport, which has more resupply options. North of there the gravel road selection was based on which parts of the national forest were on fire. The route takes you by Panhandle Campground, but there are a lot of other campgrounds along the Pend Oreille River that would also be an option. If you’re feeling even more adventurous there are a huge number of gravel roads up in the Priest Lake area that I had to avoid thanks to wildfire. Beyond there, the route gets a little wiggly, and there are a few potential options. If you don’t need to resupply, head on up to Sullivan Lake instead of dropping into Ione. The big gravel climb up to Sullivan Lake after Ione is totally gratuitous, but also good fun on a deserted gravel road, and it gives you a fun descent down to the lake afterwards. The lake itself can be quite busy, and hard to find a camping spot… at least if you’re turning up on a long weekend like I did. If you do end up camping there, wander over and check out the landing strip in the middle of the campground, and the aeroplane camping section beside it. And then convince someone you know to get a pilots license and give up bikepacking entirely, because if flying into lakes to go camping isn’t the coolest thing ever, I don’t know what is. Metaline Falls is your last resupply in Washington before making the border crossing back into Canada at Nelway, then power along more pavement to reach Salmo. Between Salmo and Nelson you have the option to hop on the Trans Canada Trail if it’s in good shape - it wasn’t when I hit it, and so I mostly stuck on the road, which was fairly quiet at the time. Salmo, Ymir and Nelson all have resupply options, and there’s a bike shop in Nelson too. 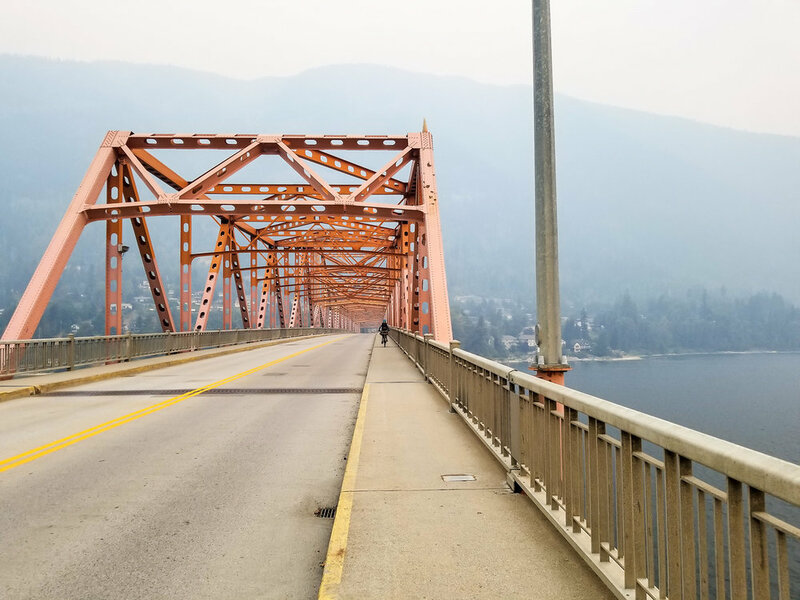 Leaving Nelson, you cross BOB (the Big Orange Bridge) and ride the highway to get to the ferry. Make sure to check the crossing times from Balfour before you go! After a relaxing free ferry ride across Kootenay Lake, you have a paved climb before you descend into whimsical Crawford Bay. Feel free to buy a freshly squeezed juice, or maybe some viking art. Refuel if you need to, because Gray Creek Pass is up next, and it’s the biggest climb on route. Settle into your lowest gear and get ready to grind on some gravel… or just walk. 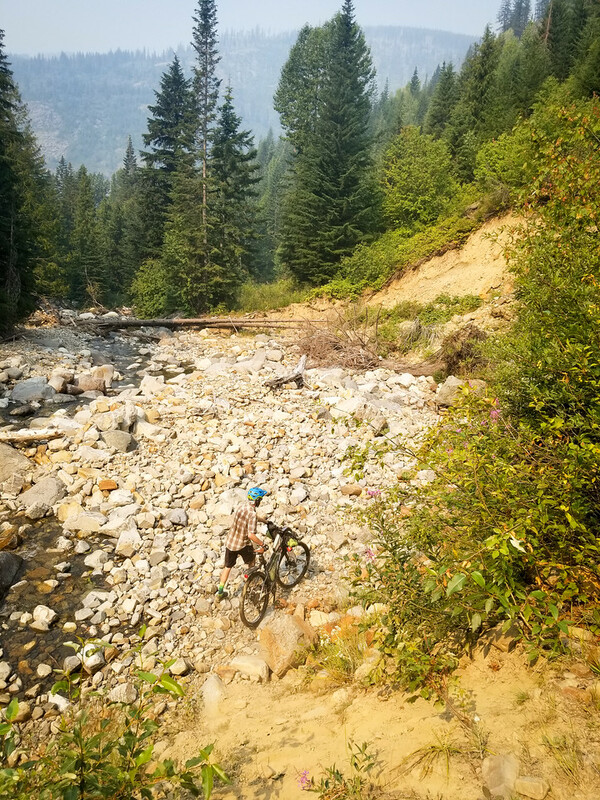 After hitting the top of Gray Creek Pass and eating a celebratory waffle (or whatever it is the kids are doing these days), settle in for a rough descent that comes to an end far too soon. The road gets kind of rough, and you start to hit logging terrain. Keep an eye out for trucks and sandy patches of road! After Mary’s Lake you’re on sealed road again though, and there are a couple of different ways to get into Kimberley depending how your legs are feeling at this point. From Kimberley to Cranbrook is some pleasant paved rail trail. Cranbrook is teeming with resupply options (I had my second and third breakfast there, and thought I’d better call it quits before I started on first lunch). Past Cranbrook the rail trail continues, but in gradually worsening condition. Some of the gravel Trans Canada Trail back roads near Wardner are pretty rough, and wouldn’t be much fun on skinny tires. But you’re rewarded for getting through that section with a stop by Lake Koocanusa, and icecream at the concession stand. From there, it’s the final gravel haul into Fernie (well, into Elko first, with the option to stock up for the final leg). Keep an eye out on the right for the Silver Spring Lake trailhead just after Elko, it’s a bit of a walk in, but it’s also a nice cool refreshing stop if you need one - and if you want to kill some more time before you have to get back to civilisation. 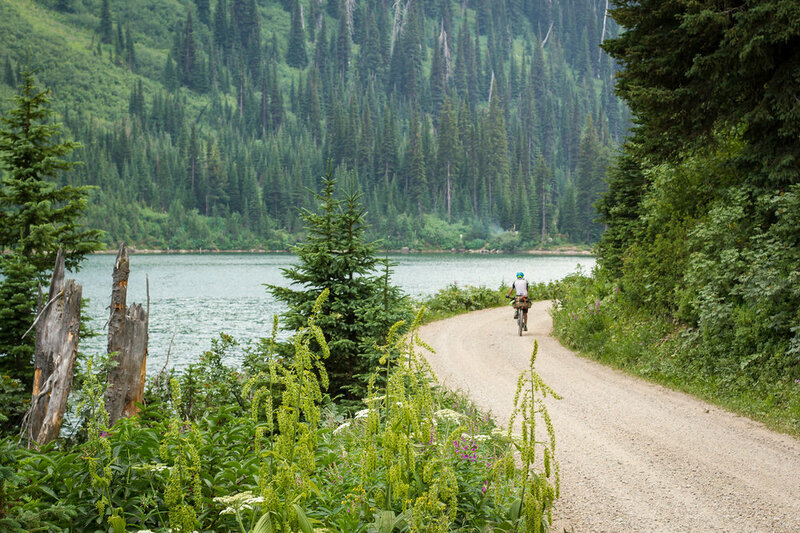 And be sure to enjoy the wide open Fernie valley as the final gravel kilometres roll by underneath you. The road surface? You’ll be on gravel roads for the majority of this loop: some are deserted, others see log haul truck traffic, particularly in the Fernie area. The route through the US covers some deserted paved road as well as deserted gravel roads, and some wonderfully cruisy riding. There are certainly a few hills to climb, but on the whole they’re not that steep, and with the exception of that one heinous hike-a-bike section, it should all be ride-able with a gravel bike (although I was happy on 29” x 2.3” tires). And there is some highway time - I’ve tried to keep it minimal, but it was hard to tie everything together without it. And there’s a little singletrack thrown in there too, but nothing a gravel bike couldn’t handle. How long will it take? Anywhere between ten and twenty days would be reasonable. 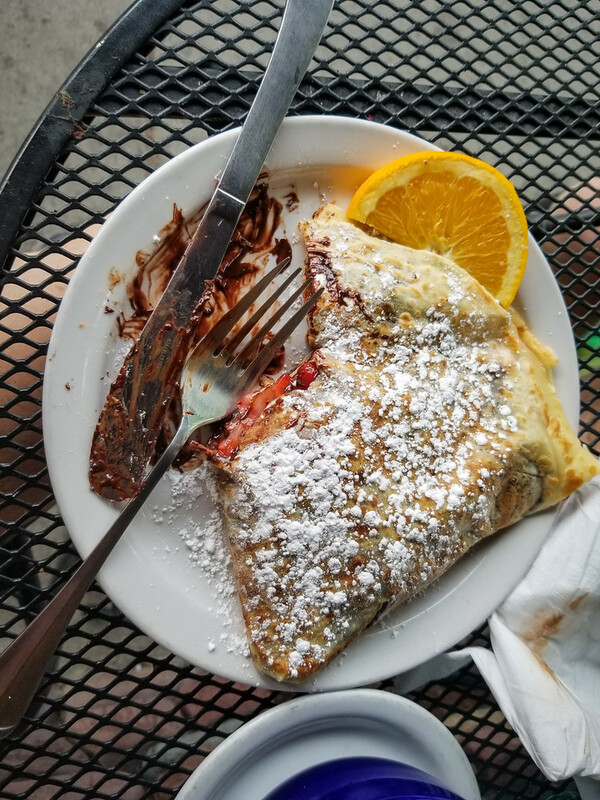 Are the crepes in Whitefish too good to rush past? Do you want to take on some extra gravel road exploration? Need a rest day? Struggle on the big hills? Struggle to get out of your sleeping bag in the morning? There are plenty of options to make the route shorter or longer. And what time of year should I ride? Any time from June to October should be good. Before June some of the passes may be still snowbound, and after October you’re likely to be looking at snow again. Hopefully the summer isn’t too filled with wildfires, as there are plenty of flammable trees along the route, so that may be another factor in your decision-making. And sure, it’s not entirely in Canada. But there’s no wall there - why not enjoy the gorgeous country on both sides of that artificial divide?